You might be a badass with a barbell, but see if you can dominate these tough strength tests. How strong are you really? You might be a badass with a barbell, but see if you can dominate these tough strength tests. We love cardio as much as the next fitness enthusiast, but if you *really* want to shape up, you can't ignore strength training. "Weights train your muscles to contract and generate a force against external resistance, and other forms of exercise don't really do that," says Pete McCall, M.S., C.S.C.S., adjunct faculty in exercise science at Mesa College in San Diego. "Running, indoor cycling and other types of cardio exercise don't use the muscles in quite the same way." Basically, it's a pretty crucial element of your fitness overall. Pull-ups get a lot of attention, especially since the CrossFit craze doesn't seem to be going anywhere, but McCall recommends testing your chin-up instead. Why? Because ultimately, chin-ups put less torque on your elbows (meaning they're safer to practice for a longer period), and they allow you to recruit your biceps more effectively to lift your body weight. Start in a dead hang from a sturdy chin-up/pull-up bar, with your hands a comfortable distance apart, palms and fingertips facing your body. Then, pull! Your chin should come over the bar to successfully complete one rep. If you can do five or more unassisted chin-ups, you're super strong. If you can get in even just one rep, that's awesome too. If it's not happening, McCall recommends using a 3/4-inch-thick super band. Many gyms stock these, and they're easy to find because they look like giant, oversize rubber bands. Loop it around the bar, pulling one end through the other, and slide one foot in the bottom loop of the band. If you can do eight to 10 chin-ups with the 3/4-inch band, work toward the same number with a thinner one, and so on until you can do an unassisted chin-up. This exercise tests the strength of your arms, back, and shoulders—essentially the "pulling" muscles in your upper body. 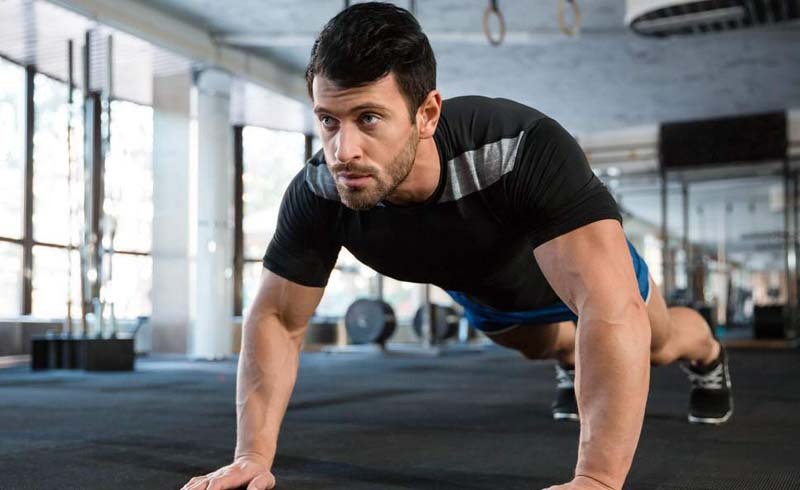 Once you've tested your upper body pulling strength, it's time to move on to upper body pushing strength, and—you guessed it—that means push-ups. Testing how many you can do with good form measures the strength of your chest, shoulders, and triceps, according to McCall. And what qualifies as good form? "Your full body from your hips to your shoulders should be in a straight line, and when you do a push-up everything is moving at the same time," explains McCall. "Your shoulders aren't coming up higher than your hips and your hips aren't coming up higher than your shoulders. You're moving in one solid straight line as you're going up and down." Roger that. If you can do eight or more full-body push-ups, you're killing it. If you can do between three and five, that's pretty great as well. If you aren't able to do a full push-up on your toes while keeping your whole body in check, modify by going down to your knees and aim for 10 to 12 reps. This exercise measures what's known as explosive strength. Exercises like barbell squats and deadlifts test your maximum strength, which is a super-important piece of your overall strength profile. But explosive strength is a critical part, as well. "Doing this exercise may be like going back to the fitness test you did back in elementary school," says McCall, but it's one of the easiest ways to test your explosive power. The standing long jump is essentially seeing how far you can jump forward from a standing position. Start with your feet hip- to shoulder-width apart. When you're ready, squat down, swing your arms, and jump forward. You are totally allowed to use as much momentum as you can generate in order to jump as far as you can. To measure the distance you're jumping, check to see if your gym has lines already mapped out on the gym floor, or recruit a buddy and have them track your jump with a tape measure. A seriously impressive long jump is 5 feet or more, but if you're able to do 3 feet or more, you're on the right track. Not quite there yet? Aim for 2 feet and work your way up. If you don't train jumping very much currently and your measurement is on the lower end, don't get discouraged. McCall says this is one area where you can rapidly improve once you start practicing the movement regularly. In this exercise, you're syncing all the major lower body muscles: glutes, quads, and hamstrings, so it's a really efficient way to see how good you are at coordinating everything together. He also points out that explosive training activates type II (aka fast twitch) muscle fibers, which are the ones responsible for muscle definition. So, if you want to see some seriously chiseled legs, this is the kind of exercise you want to focus on. The squat is one of the most common and basic strength training exercises, and it's an amazing way to measure your lower body power. McCall recommends the goblet squat, where you hold a kettlebell or dumbbell vertically close to your chest and squat down low enough to sit down. For this particular exercise, below parallel isn't necessary. See how many you can do with a 35- or 40-pound dumbbell or kettlebell (the equivalent of a heavy suitcase!) until you fatigue and can't maintain good form. Wondering what good form looks like? "It's a matter of keeping your elbows close to your ribcage and keeping your chest up, without resting the weight on your body. You don't want your spine to bend or round in this exercise." The goal here is to be able to knock our eight to 10 reps at this weight while maintaining good form, primarily using your quads and glutes to do the movement and your core to stabilize your upper body. If you're having trouble, reduce the weight you're working with and know you can work your way up over time.